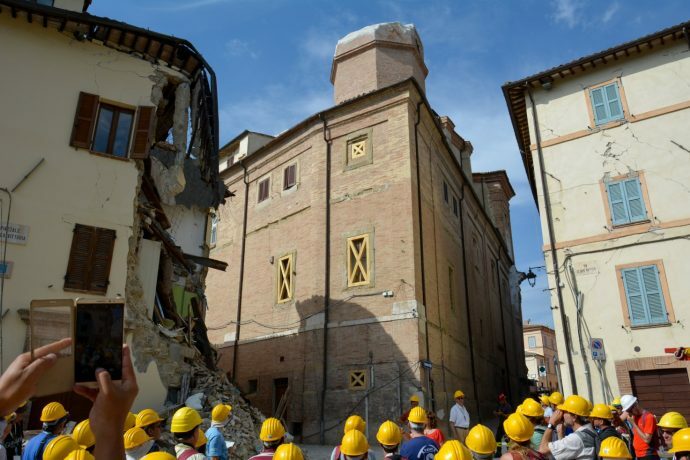 The International Field Trip “From 1997 to 2016: Three Destructive Earthquakes” was held from 19 through 22 July 2017 in the epicentral area of three destructive earthquakes that hit Central Italy in the last 20 years: Umbria-Marche (Sept. 26, 1997, Mw 6.0), L’Aquila (Apr. 6, 2009, Mw 6.3) and Amatrice-Visso-Norcia (the seismic sequence ongoing since the 24th of August, with a max. Mw 6.5 on Oct. 30, 2016; this was the largest earthquake in Italy after the Mw 6.9, 1980 Irpinia eq.). 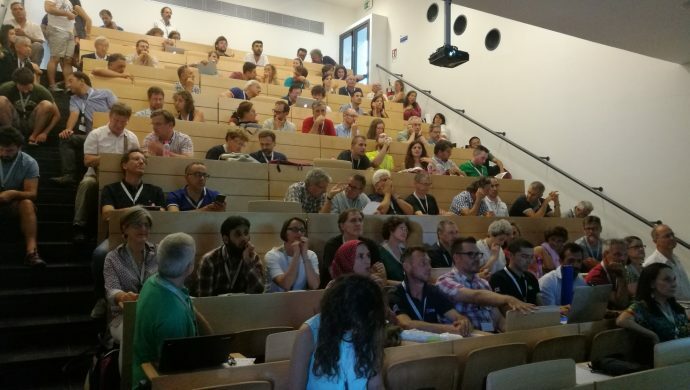 This meeting provided a unique opportunity to observe the causative active and capable faults belonging to a coherent and interacting fault system and participants were able to evaluate the contribution of active fault-field-based studies on seismic hazard analysis. The organizing and scientific committee was led by Prof. Emanuele Tondi (Sezione di Geologia, Scuola di Scienze e Tecnologie, Università di Camerino, Italia) who coordinated researchers from seventeen different institutes (from Italy, UK, France, Greece). The event was co-sponsored by the IFG EGSHaz, INQUA TERPRO Commission. The 118 field trip participants represented thirteen countries from five continents. 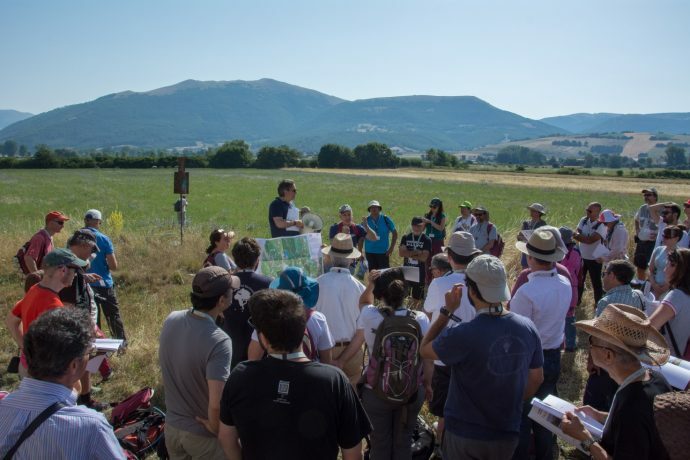 The scientific program included one very busy afternoon of introductory talks, held at the University of Camerino Campus, and a 3-days field trip, which brought participants to visit the key sites of the three epicentral areas, from NW to SE, along the backbone of the Central Apennines. On the afternoon of the 19th of July, the scientific session started with welcoming remarks by Prof. Flavio Corradini (Dean of the UNICAM) and Prof. Carlo Doglioni (President of INGV), followed by an introduction to the Internationl Field Trip by Prof. Emanuele Tondi. Then, three talks focused on the main features of the three seismic events. Massimiliano Barchi (UNIPG) and Giusy Lavecchia (UNICH) presented an overview of the Apennines, from the geologic and active tectonics point of view, in the framework of the Mediterranean area. Lauro Chiaraluce (INGV) talked about the seismicity of the three earthquakes, followed by Roberto Devoti (INGV), who presented the GPS data, and Stefano Salvi (INGV) who showed the INSAR data for each event. Finally, Eutizio Vittori (ISPRA) discussed the active faults and coseismic surface effects in the epicentral areas of the 1997 Umbria-Marche and 2009 L’Aquila earthquakes, whereas Paolo Marco de Martini (INGV) illustrated the ones of the 2016 Amatrice-Visso-Norcia sequence. The scientific session ended up with an open poster session with 22 contributions. 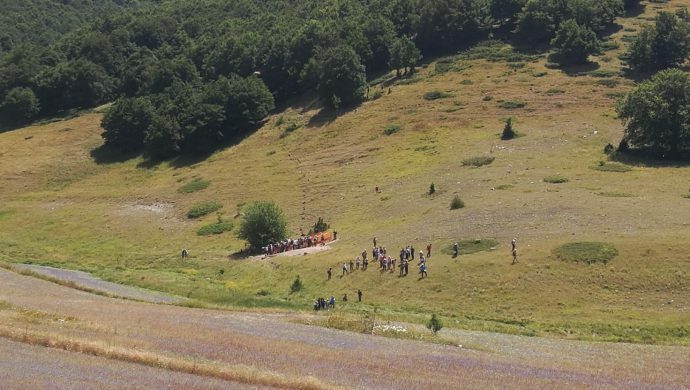 The first day of the field trip, July 20th, the group visited the epicentral area of 1997 Umbria-Marche earthquake. Here, at the romanesque Church of Santa Maria in Plestia, after the introduction of the geology of the area with panoramic view over the Colfiorito basin, the participants reached the Colfiorito Border Fault scarp on the Faento Mountain. Then, the group moved to the swamp of Colfiorito, close to a karst sink-hole, where geomorphological and archaeological evidence of fault activity can be observed. The last stop was in the Red Zone of Camerino city, with the observation of buildings damaged during the 2016 seismic sequence. Before the Social Dinner, the INQUA Business Meeting, led by Alessandro Maria Michetti (INSUBRIA), was held at the UNICAM Campus; the paleoseismic projects developed by INQUA and the forthcoming INQUA meeting which will be held in November in New Zealand, were presented. In particular, Stéphane Baize (IRSN) described the progress of the SURFACE project and the SURE database. The field trip group at Pian Perduto the morning of 21st of July, visiting the paleoseismological trenches excavated by INGV and IRSN throughout a secondary fault that moved during the October 30th mainshock. The second day, July 21st, was dedicated to the epicentral area of 2016 Amatrice-Visso-Norcia earthquake. At Forca Canapine, the geology of the Castelluccio Basin was introduced, combined with a panoramic view of the Mt. Vettore, crossed by the surface expression of major faults activated during the last earthquake sequence of 2016. The second stop was at Pian Perduto, north of Castelluccio village, visiting two paleoseismological trenches excavated by INGV, in collaboration with IRSN, throughout secondary faults that moved during the Oct. 30th mainshock. 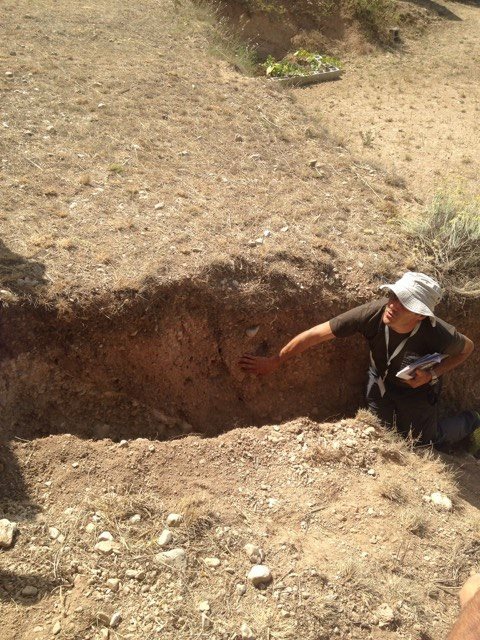 The exploratory trenches have the purpose to study the seismic events that occurred in the past and which have permanently deformed the soil in the proximity of the fault. The last stop of the day was at Forca di Presta, where the participants split in three groups: one walked along the fault segment located on the southern slope of Mt. Vettoretto in order to arrive just below the top of Cima Redentore, to appreciate the metric fault scarp, commonly named “Cordone del Vettore”; the second one continued up to the end of Mt. Vettoretto, reaching the “Cordone del Vettore” fault scarp close to Scoglio dell’Aquila, where the offset shows a “free face” with about 2 m vertical throw; the third one walked along the SE termination of the “Cordone del Vettore” fault, visiting one paleoseismological trench excavated by INGV and IRSN. During the night, the field trip attendants were suddenly woken up at 4.00 in the night, by a Mw 4.0 earthquake, which reactivated the Campostosto segment of the fault system and recalled everyone that the seismic sequence is still ongoing. The last day, July 22nd, the field-trip reached the epicentral area of the April 6th, 2009, L’Aquila earthquake. 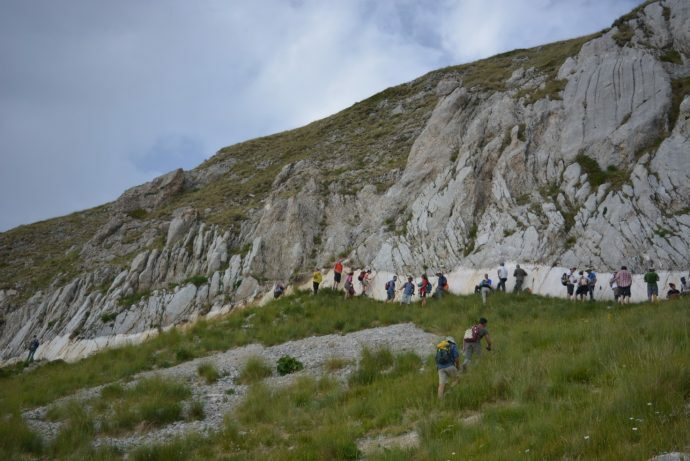 After the introduction of the geological setting of the Middle Aterno valley, where L’Aquila is located, the group observed the evidence of surface faulting along the Paganica-San Demetrio Fault, at the NE margin of the Paganica village. In this area, the April 6th 2009 event, caused the failure of the Gran Sasso aqueduct: the following excavation to repair the rupture provided an extraordinary exposure of sediments displaced by a system of fault splays, and unequivocal paleoseismological evidence of Holocene coseismic offset significantly larger than that of the last event. The coseismic faulting is also clear at the paleoseismic trench excavated by INGV at the Zaccagnini site. The last stop was at L’Aquila city centre, where Engineer Fabio Liberati coordinator of the project “Officina L’Aquila” presented the reconstruction projects of the city centre. The policy of this virtuous project is to rebuild the city “Com’era, Dov’era” (“as it was and where it was”): an example is the historic small palace in reconstruction, that the group had the opportunity to visit. The almighty expression of coseismic rupture occurred during the last earthquake sequence of 2016, at Scoglio dell’Aquila (2 m offset), the afternoon of 21st of July, 2017. The field trip ended at Hotel Fiordigigli with a roundtable open discussion moderated by Daniela Pantosti (INGV). The participants agreed on a new vision of the use of geological data for seismic hazard assessment, including the slip history of active faults and the detailed field mapping of capable structures for seismic microzonation purposes. All the three days field trip were exceptional and it was unanimously agreed that the organization was remarkable. The heterogeneity of researchers resulted in an excellent combination of experience and new perspectives that will drive the next years of work, hopefully together. 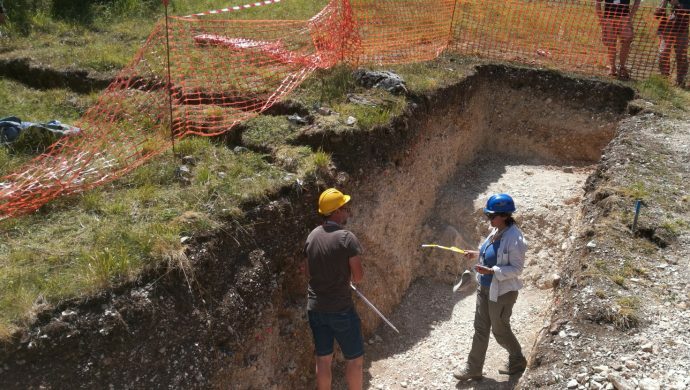 Paolo Boncio (UNICH) shows the main evidence of surface faulting occurred during the 2009 April 6th earthquake, on the trench wall at Zaccagnini site (Paganica, L’Aquila), the morning of 22nd of July, 2017. 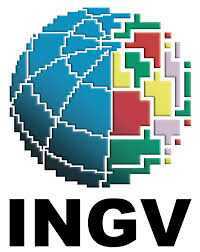 The field trip was supported by INGV, INQUA, and IRSN.